PaperKarma is an amazing app for iOS, Android, and Windows mobile devices. The app lets you take photos of your unwanted postal mail and submit them for removal from the sender’s list. For some reason, at the time of this writing, the PaperKarma.com website is showing a password reset request for a random user. It shows up, and then disappears for anyone visiting the site. See below for a screen shot. Click the image for a larger view. It seems that everyone who lands on the site is inadvertently initiating a password reset request that’s being sent to gnasman@yahoo.com. 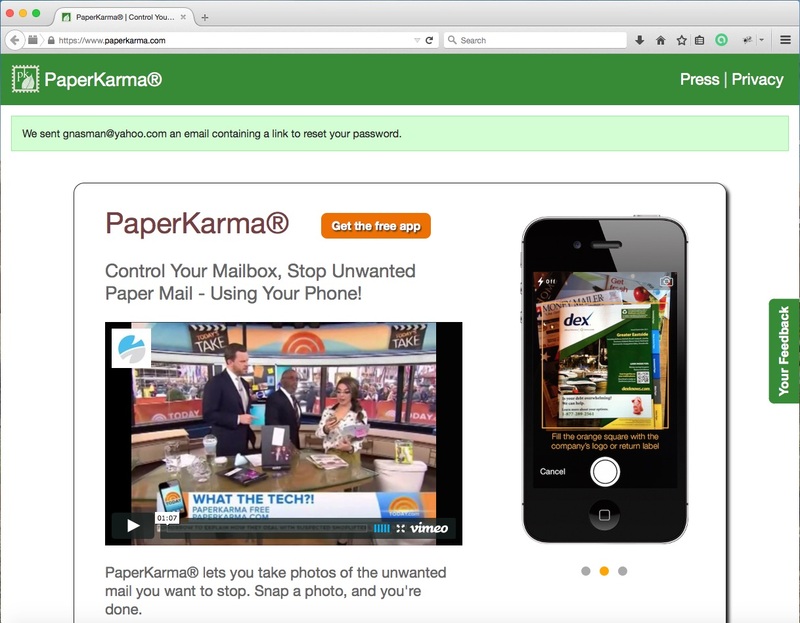 Visit the PaperKarma.com website to see for yourself.